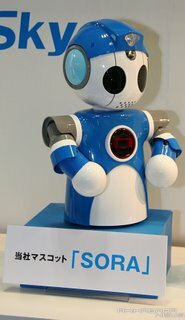 Meet SORA, the latest and greatest secretarial robot to come out of Japan. She has an integrated camera, microphone, speaker and business card scanner. She can take pictures of people and even act as a videoconferencing unit to communicate with those dirty people you don t want stinking up your office. The only downside about SORA is that she doesn t work for wages, therefore the whole "I'll do anything for a raise" is taken out of the picture.